Studying water systems in Los Angeles County is key to devising policies that will get the county to 100 percent local water by 2050. UCLA’s Sustainable LA Grand Challenge announced the awarding of its first competitive research grants today, providing $1.2 million to 11 projects, which range from developing lightweight solar panels that double as batteries to exploring how to unite the region’s 215 water systems to minimize imported water. These and $300,000 in other recent grants mark the first time that some of the wide range of environmental and sustainability research already conducted at UCLA will be funded directly by the challenge. The Sustainable LA Grand Challenge is a university-wide research initiative to transition the Los Angeles region to 100 percent renewable energy, 100 percent local water and enhanced ecosystem health by 2050. The project unites more than 150 faculty from 70 different departments to ensure that quality of life continues to improve even in a hotter, more populous Los Angeles. The selection process for funding the 11 projects was guided in part by the research priorities identified in Sustainable LA’s new Five-Year Work Plan, a futuristic vision of Los Angeles with a detailed proposal for how the challenge will achieve its goals. 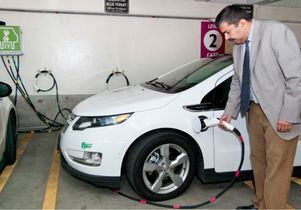 UCLA professor Rajit Gadh at an electric vehicle charging station in a UCLA parking structure. Fuel-efficient cars pay for themselves fastest for owners who drive the most. Researchers examine whether drivers for ridesharing companies could be used to speed up the adoption of zero-emission vehicles in Los Angeles. Researchers: Brian Taylor and Juan Matute (Luskin School of Public Affairs). Algae-based biofuels can be grown in part from industrial carbon dioxide emissions, municipal food waste and green waste streams, and agricultural waste. Researchers are examining the potential costs and effects on air pollution. Researchers: Deepak Rajagopal (Institute of the Environment and Sustainability) and Suzanne Paulson (atmospheric and oceanic sciences). Flexible solar panels and flexible batteries have both been demonstrated separately and could make things like power-collecting window shades a reality, but solar panels can’t store energy without batteries. Researchers are working on a paper-thin device to unite the two. Researchers: Bruce Dunn and Yang Yang (Henry Samueli School of Engineering and Applied Science), with Kevin Daly (School of the Arts and Architecture). A “smart grid” that allows customers to generate power for the electric grid will require electric utilities to transform. Researchers will look at two major regional utilities and their different regulatory models to determine how to achieve that transformation. Researchers: Ann Carlson (UCLA School of Law) and William Boyd (University of Colorado Law School). Membranes to pull nutrients out of wastewater in treatment plants could be the wave of the future, but membranes get clogged. UCLA researchers have developed a new coating system to make the membranes last longer and produce more freshwater. Researchers: Richard Kaner (chemistry and biochemistry) with Eric Hoek and Shaily Mahendra (Henry Samueli School of Engineering and Applied Science). Los Angeles needs local water, but regional infrastructure pushes rain to the ocean to avoid flooding. Researchers will create a regional climate model to better project heavy rainfall events to guide the development of a better water system and enhance local water supplies. Researchers: Alex Hall (Institute of the Environment and Sustainability) and David Neelin (atmospheric and oceanic sciences) with Dennis Lettenmaier (geography). All 215 community water systems in Los Angeles will have to work together for the region to shift to 100 percent local water. This project will create a feasible local water market for trading and selling county water resources, with input from stakeholders. Researcher: J.R. DeShazo (Luskin School of Public Affairs). Women disproportionately obtain and manage household water in developing nations, and housework remains highly gendered in the United States. Researchers will use surveys and in-home study to determine whether there are gender differences in residential water use that could be used to improve conservation strategies. Researchers: Jessica Cattelino (anthropology) and Rachel Lee (English and gender studies). 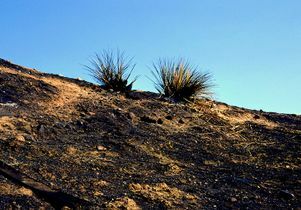 Researchers will assess the drought’s effects on habitat vulnerabilities. 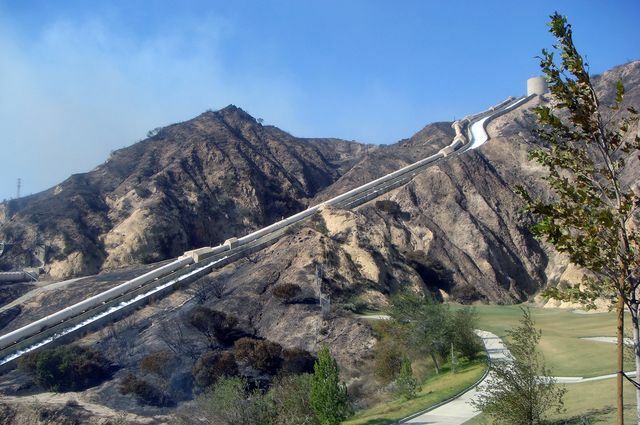 California’s recent drought changed vegetation and the risk for fires and landslides near critical infrastructure. Researchers will assess the drought’s effects to determine how future droughts could cause ongoing habitat and energy infrastructure vulnerabilities. Researchers: Glen MacDonald (Institute of the Environment and Sustainability), Greg Okin and Tom Gillespie (geography), Richard Ambrose (environmental health sciences) and Philip Rundel (ecology and evolutionary biology). Native shrubs are well-adapted to survive seasonal drought, but can they survive multi-year droughts caused by climate change? Researchers will collect data to evaluate how long-term water stress affects their growth. Researchers: Ulrike Seibt (atmospheric and oceanic sciences) and Lawren Sack (ecology and evolutionary biology). 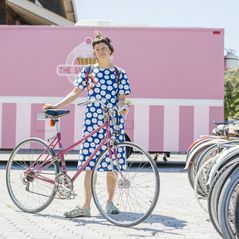 Researchers will examine what inspires people to choose bikes or bike-sharing for transportation. The study will use before-and-after studies, accelerometers, pollution data and more to determine the health benefits but also the risks, such as the amount of air pollution inhaled. Researchers: Michael Jerrett and Christina Batteate (Fielding School of Public Health). In addition to the 11 competitively awarded projects, Sustainable LA has funded a number of graduate-student and postdoctoral fellows and has invested more than $300,000 in directed-research projects. Tracking biodiversity is a key component of the UCLA Sustainable LA Grand Challenge. Annual bird counts collected by amateur enthusiasts have created a treasure-trove of unexamined records. Researchers will analyze the last 40 years of data to see whether species’ distributions have changed countywide. Researchers: Tom Gillespie (geography) with Thomas Smith and Ryan Harrigan (Institute of the Environment and Sustainability). Researchers are creating a biodiversity atlas to assess the quantity and types of plant and animal species in Los Angeles County to determine the current baseline, which can be used to determine species’ declines or progress in the future. Researcher: Tom Gillespie (geography). The California floristic region is the only place on the continent identified by Conservation International as one of the world’s “25 Biodiversity Hotspots.” UCLA faculty are using their expertise to provide state regulatory and resource managers with a series of workshops on conservation genomics, conservation law, and community engagement to improve conservation planning and management. Researchers: Brad Shaffer (Institute of the Environment and Sustainability), Cara Horowitz (School of Law) and Ursula Heise (English). Using local water requires knowing all the resources. Researchers will create a county water inventory by accounting for rain, snow, imported water, recycled water, wastewater discharged to the ocean, groundwater inputs and extractions, storm water capture and more. Researchers: Steve Margulis and Gonzalo Cortes (Henry Samueli School of Engineering and Applied Sciences). Researchers will examine water conservation programs all over the world, then make recommendations to state and local water management leaders on what approaches have been most effective at getting urban dwellers, businesses and agencies to reduce daily water consumption. The project will also evaluate the feasibility of new water conservation technologies on the horizon, and whether the goal of using 50 daily gallons per capita is reasonable. Project approved; researcher to be determined. Moving to 100 percent renewable energy will likely require new technologies to be efficient and affordable — but how much renewable energy can the county produce right now? Researchers are measuring the county’s current-day renewable energy potential. Researchers will then suggest possible technological and policy solutions to achieve exclusively renewable energy more effectively and at a lower price. Researchers: Richard Wirz and Rajit Gadh (Henry Samueli School of Engineering and Applied Sciences) with Stephanie Pincetl (Institute of the Environment and Sustainability). Cascades of the Los Angeles Aqueduct. Michael/Flickr. Creative Commons 2.0. 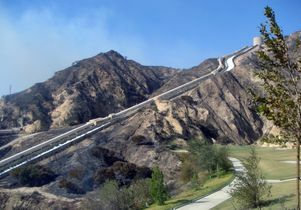 Wildfire aftermath in Malibu. Gilbert Mercier/Flickr. Creative Commons 2.0. 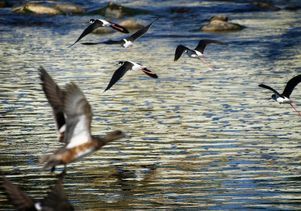 Birds on the Los Angeles River. Greg Lilly/Flickr. Creative Commons 2.0.